Digital Guardian compliance solutions deliver cost-effective data discovery, data classification and data loss prevention for data privacy and compliance with GDPR, HIPAA, PCI and more. Digital Guardian for GDPR finds and protects EU residents’ sensitive, personal data. Digital Guardian for ITAR allows your organization to locate, secure, and document defense related data. Digital Guardian for PCI/DSS discovers and protects financial data at rest, in use and in motion. Digital Guardian for HIPAA compliance locates and protect sensitive patient data throughout the integrated delivery network. Complying with diverse and expanding regulatory requirements in an efficient, cost-effective way is not easy. Whether it’s HIPAA (PHI), GDPR (EU citizens personal data), PCI (cardholder data), or NERC-CIP (operational and systems data), regulatory requirements are focused on protecting data. Do you know what it takes to identify this data throughout your organization, classify it accurately and make sure it’s controlled properly? of regulated data such as personally identifiable information (PII) or personal health information (PHI) over all communication channels - even data carried over SSL- encrypted sessions. It is the industry’s most easily deployed and managed enterprise DLP - protecting regulated data in healthcare, financial services, government, retail, and other industries. Discover, monitor and control regulated data, whether on the network, at rest in workstations and file shares - or stored in the cloud. Our Cloud Data Protection allows organizations to adopt cloud storage while maintaining the visibility and control they need to comply with privacy and data security regulations. Our Database Record Matching fingerprinting technology is the industry’s most accurate for identifying and controlling personal information. By focusing on protecting personal information, we provide banks, hospitals and others with the absolutely lowest false positive rate of any DLP technology available. 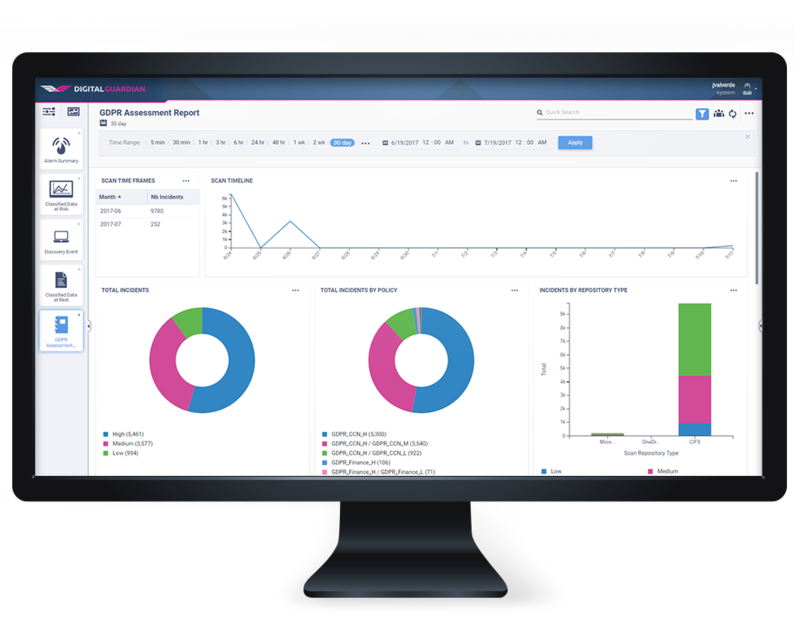 Our compliance solution combines content inspection, policy creation, and management in one appliance, greatly simplifying deployment and management without sacrificing accuracy or effectiveness. It’s recognized for delivering the lowest total cost of ownership with no dedicated resources required to manage. These appliances are available as hardware, virtual or cloud (Azure and Hyper-V). Within literally minutes of the appliance being plugged in, we started collecting data. Once we saw items that could become major issues for us, we were able to remediate potential problems right away. Learn how we enable care providers while confidently protecting patient data at St. Charles Health Systems.